With Tony Horton’s 22 Minute Hard Corps, your Mission is to work out hard and eat right so you can get a Boot Camp body. But, can you get strong and fit while following a vegetarian diet or going meatless for a few days? The answer is a resounding yes. 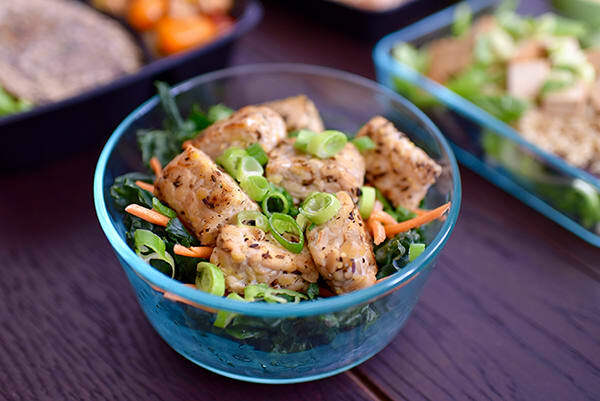 Use this advanced food preparedness guide to prep five days of meatless meals that have the right balance of protein, carbs, and healthy fats to help you reach your goals. Use the Initial Briefing Entrance Questionnaire (on pg. 2 of your Rations for Results Field Guide) to determine your recommended 22 Minute Hard Corps Ration Plan. This will tell you which calorie level you should follow and how many color-coded rations containers to eat each day. 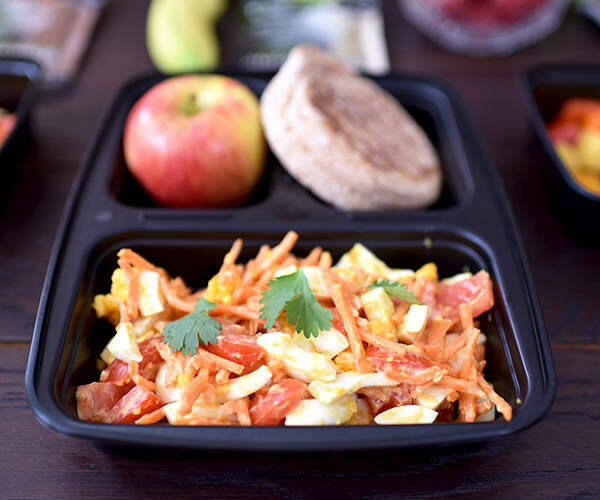 Daily rations in this 22 Minute Hard Corps meal plan include three square meals and two snacks that will stimulate your palate and fuel your workouts for those eating at the 1,500–1,800 calorie level. Depending on your goals and how many calories you strive to eat each day, you might need more, or less, food than is shown here. Use this menu and grocery list as a starting point to create your own vegetarian meal prep menu, and increase or decrease the amounts of foods, or add some of your favorites. 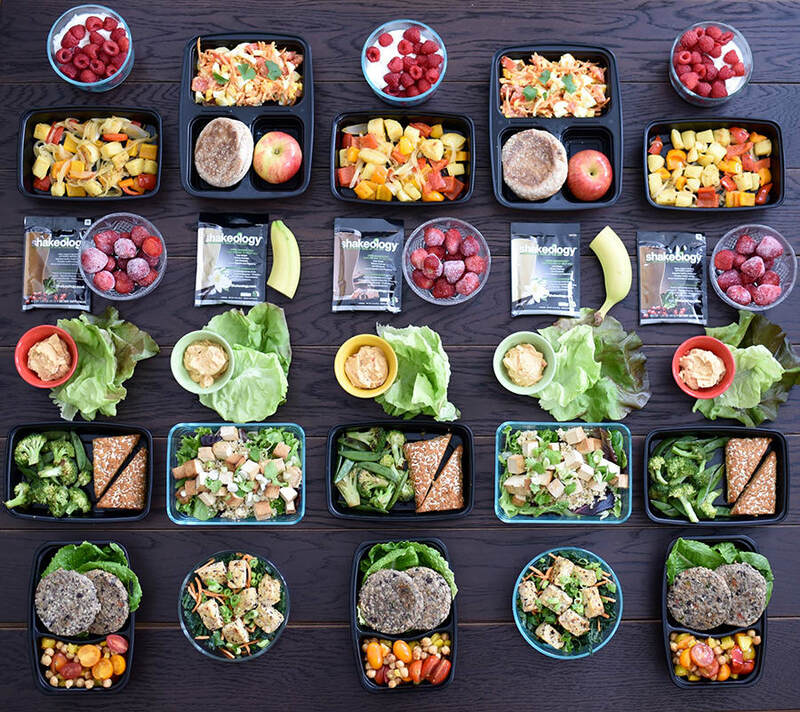 Meat-eaters can use this meal prep too! 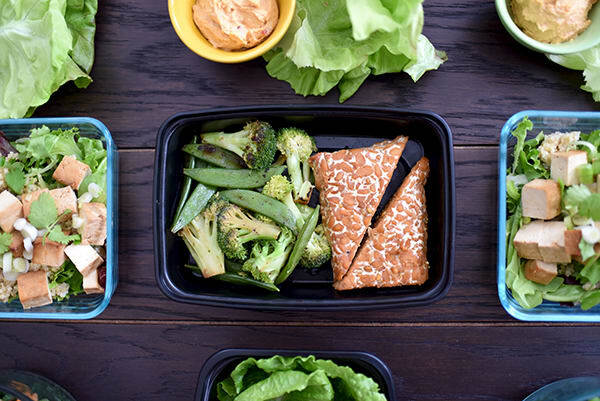 Whether you decide to add meat to some or all of these meals, simply swap out tofu, tempeh, or veggie burgers for your favorite lean protein from the Red Rations list. 1. Heat oven to 400° F. To make the marinade for the Baked Tempeh, combine 1 Tbsp. fresh orange juice, 1 Tbsp. rice vinegar, 1 Tbsp. reduced-sodium soy sauce, 1 chopped garlic cloves, 1 tsp. finely chopped fresh ginger, 1 tsp. sesame or olive oil in a small bowl and whisk to blend. Place 12 oz. of tempeh in a glass baking dish and pour marinade over the top. Cover dish with foil and place in a refrigerator for 30 minutes, flipping tempeh over after 15 minutes. Place the dish, still covered in foil, in the oven and bake. After 15 minutes, remove the foil, flip the tempeh and cook uncovered about 5 minutes more. Remove from oven and set aside. 2. Next, cook the veggie burger patties. To save time, this can be done in the oven while the tempeh bakes (or, keep the veggie burger patties frozen until you’re ready to eat them). Spray a metal baking sheet (or cast iron skillet) with nonstick spray. Arrange six patties on the sheet and bake according to the instructions on the package. When done, remove the pan from oven, and set aside. Turn off oven. 3. A rice cooker will make quick work of cooking the quinoa, and will shut off automatically when it’s done. If you do not have a rice cooker, it can be cooked on a stovetop. Cook ½ cup quinoa in 1 cup water and then set aside to cool. 4. Next make the sweet potato hash. Heat water in a small pot with a steamer basket over high heat. Peel the sweet potato and cut it into bite-sized pieces. When the water in the pot is boiling, place sweet potato in the steamer basket and steam until soft when pierced with a fork, about 5–8 minutes. Remove from heat and set aside. 5. Slice one onion and chop two bell peppers (reserve a few onion slices for the veggie burgers, if desired). Heat 1 Tbsp. olive oil in a pan over medium heat. Add onion and bell peppers and cook, stirring frequently until onion is translucent and peppers are soft. Add sweet potatoes and cook two minutes more. Season with salt and pepper if desired. Remove from heat and divide the sweet potato hash evenly between three food storage containers. When cool, place containers in the refrigerator. 6. 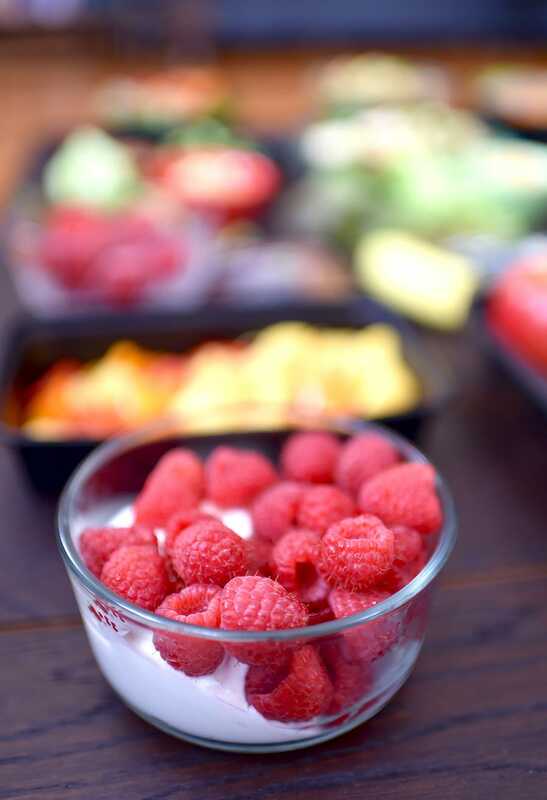 Fill three small food containers each with ¾ cup yogurt and 1 cup berries. Place in refrigerator. 7. Next hard-boil eggs for the egg salad breakfast. Place 4 eggs in saucepan and add enough water to cover the eggs by one inch. Bring water just to a boil over high heat. Remove from heat, cover, and let stand for 12 minutes. While eggs cook, prepare a large bowl of ice water. Carefully remove the eggs from the hot water with a slotted spoon and transfer to the ice water. 8. When eggs are cool enough to handle, peel and chop them, and place them in a bowl. Add one chopped tomato, 1 cup shredded carrots, 2 tsp. mustard, and 2 tsp. olive oil and mix well. Divide egg salad mixture evenly between two food storage containers. Garnish with parsley, cilantro, or green onions if desired. Place in refrigerator. Serve with a whole-grain English muffin and a medium apple. 9. Season remaining 8 oz. tempeh with ½ tsp. ground cumin, and salt and pepper to taste. Spray a nonstick pan with cooking spray and heat over a medium flame. Add tempeh and cook 2-3 minutes per side. Remove from skillet and set aside. 10. Next, build the Spiced Tempeh and Kale Salads. Wash two cups of kale then remove and discard the rib from each leaf. Chop the kale, then squeeze it roughly as though you were wringing out a towel. 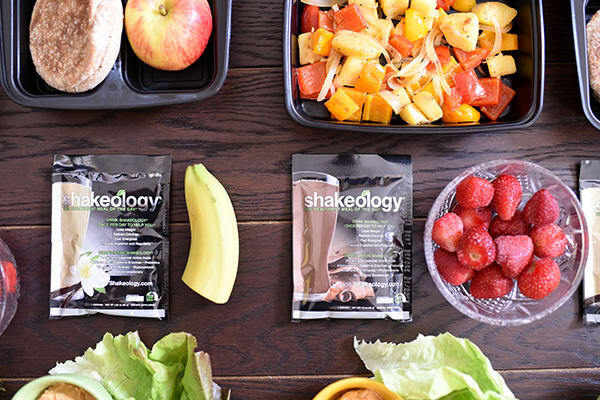 This breaks down its tough fibers making it easier to digest. Divide the kale evenly between two food storage containers. Top each with 3 oz. of cumin-spiced tempeh. We added chopped green onions and 2 Tbsp. of shredded carrots to each salad for color. You may add a small amount of any remaining vegetables from this meal prep. Place salads in refrigerator. Serve with 1 tsp. olive oil and 1 tsp. balsamic or other vinegar. 11. 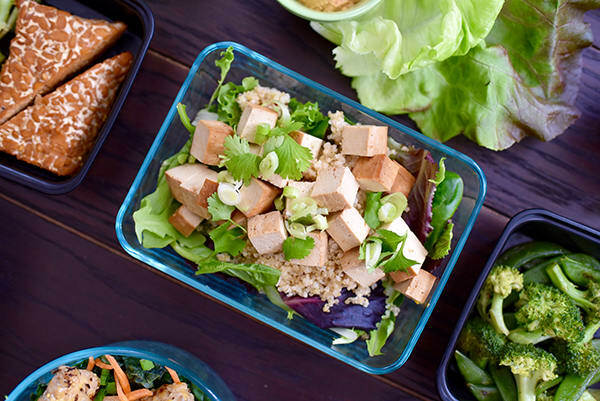 Arrange three food storage containers for building the Baked Tofu and Quinoa Salads. Add a cup of lettuce to each container. Top with ½ cup quinoa and 8 oz. baked tofu. Add “free” ingredients, like green onions, jalapeño, and cilantro if desired. Serve with 2 Tbsp. of a salad dressing of your choice. 12. In a medium bowl, combine one can of chickpeas that have been drained and washed, 1½ cups halved cherry tomatoes, 1½ cups chopped bell pepper, and 4-6 Tbsp. balsamic vinaigrette (or 3–4 Tbsp. balsamic vinegar and 4 tsp. olive oil). Mix well. Divide evenly between three large food storage containers (with two compartments if possible). 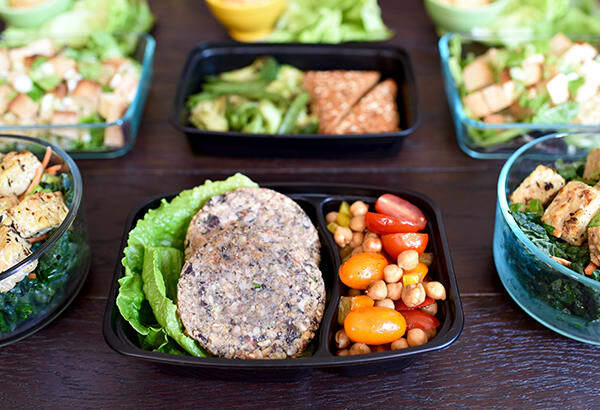 In same containers, arrange two large lettuce leaves and two veggie burger patties. Serve with mustard and remaining sliced raw onion (if desired). 13. Heat a wok or large sauté pan over medium heat. Add 1 Tbsp. olive oil (or coconut oil), 1½ cup broccoli florets, and 1½ cup snow peas. Cook, stirring frequently for 3–5 minutes until tender crisp. Season with salt and pepper if desired. Set aside to cool. When the vegetables are no longer hot, divide them between three food storage containers. Add 3 oz. marinated tempeh to each and place in the refrigerator. 14. Prepare daily hummus snacks. 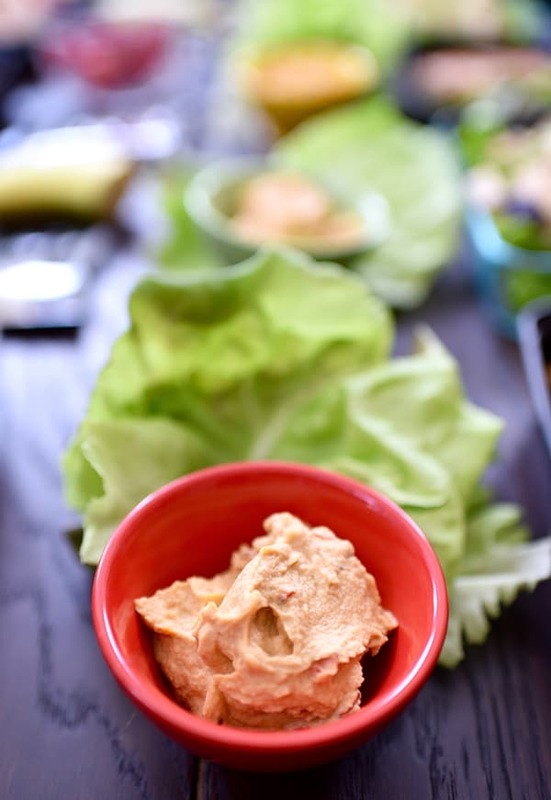 In each of five food storage containers, place ¼ cup hummus and 2 large lettuce leaves. Place in refrigerator.